Item #OC-BH-641-1: 14Kt. 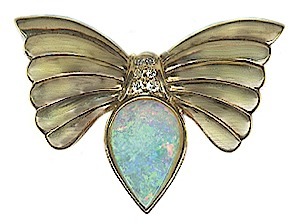 Yellow Gold Pendant/Brooch with one bezel set 10x16mm pear shape Australian Opal of 3.60 cts. and six bead set round Diamonds of .12 cts. TW.